Czech manufacturer Aircraft Industries, a subsidiary of Russia’s Ural Mining and Metallurgical Company (UMMC), moved out of the red in late 2016 and registered a net profit of 46.7 million korunas ($2.1 million). According to Zlin.cz, a local media company at Aircraft Industries’ Zlin home base, the manufacturer recovered its financial position thanks to orders for its L-410 regional turboprop aircraft that it had completed for its priority target market in Russia (in particular the L-410UVP-E20 version). One year prior to that, in 2015, Aircraft Industries had suffered a loss of 46.4 million korunas. The company’s revenues constituted 858 million korunas at the time; in 2016, thanks to the Russian sales, it ramped this up by 86.5% and hit the 1.6 billion korunas mark. In 2015, not a single of the company’s L-410s was delivered to Russia. As CEO Ilona Plskova explains, the depreciation of the Russian ruble inflicted by Western sanctions killed the market. The Czech manufacturer was on the brink of bankruptcy in May through October 2016, when it was forced to reduce its workforce from 942 to 885 personnel (by comparison, in 2015 its total personnel stood at 1,020). Moreover, the staff cutbacks were preceded by 60% long-term layoffs. In 2015 the Czech company had delivered just four L-410s (three to Bangladesh and one to Algeria), Zlin.cz reports. Prior to that Sergey Martynov, sales director for Russia and the CIS, told Russian Aviation Insider the company was planning to deliver eight airframes that year, including to Bangladesh, Nepal, and South Africa. Then, in 2016, the manufacturer managed to sell nine L-410UVP-E20s to Russia. 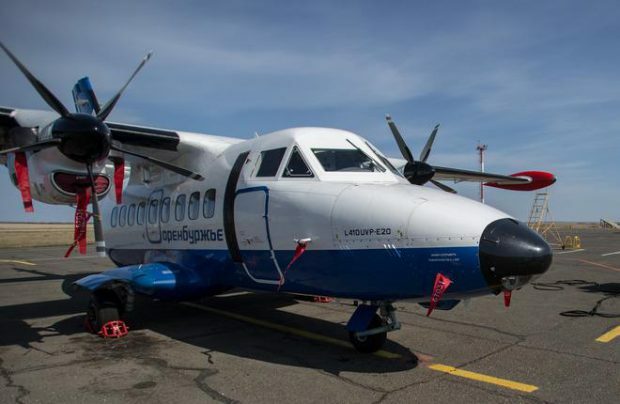 Four went to the Ural Works of Civil Aviation (UWCA) which plans to assemble L-410s in Russian Federation; three were received by Orenburg Airport (which operates local commercial flights under the brand name Orenburzhye); regional carrier Uktus and Khabarovsk Airlines received one turboprop each. This year the company is looking to deliver 12 L-410UVP-E20s. One of these has already been ferried to Indonesia, and will be operated by local carrier Susi Air. The remaining 11 turboprops are meant for Russian customers. The manufacturer is also negotiating to expand its sales geography. Next year the Czech planemaker is planning to deliver the first three example of its L-410NG upgraded variant. Prior to the MAKS-2017 air show, held near Moscow this July, Martynov said the latest derivative had almost completed its test programme, and that the company had applied for EASA certification. The manufacturer is expecting to receive the L-410NG’s European certificate in late summer, allowing it to launch the validation process in Russia ahead of production, which is scheduled for 2018.